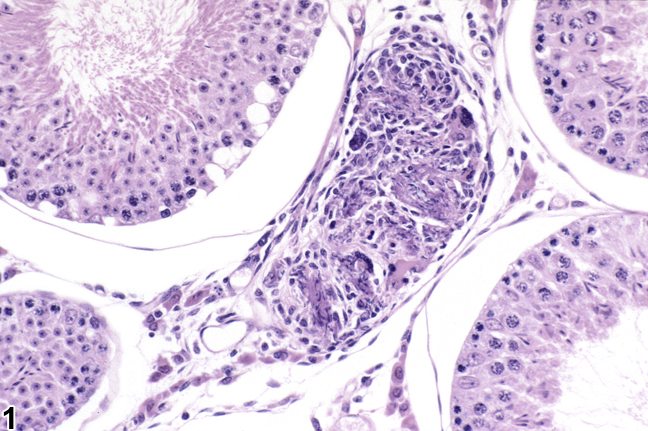 Testis - Sperm granuloma in a male hamster. Though this example of a sperm granuloma is from a hamster, its appearance in a mouse or rat would be the same. Sperm granulomas are uncommon findings in the testis; they are much more common in the epididymis. They most often occur as a sequel to sperm stasis within a tubule or within the rete testis. Sperm granulomas may progress to disruption of the blood-testis barrier and replacement of the affected seminiferous tubule with granulomatous inflammation. This is most commonly seen as an incidental background lesion. Sperm granulomas should be diagnosed whenever present. 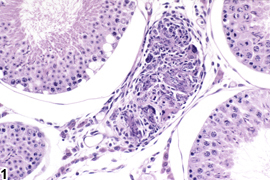 It is not necessary to grade sperm granulomas, unless the pathologist feels that grading would help identify the lesion as being treatment-related. Associated lesions, such as degeneration, should be diagnosed separately.